Stocks are heading higher and could reach 20,000 by year end, says market guru Jeremy Siegel. 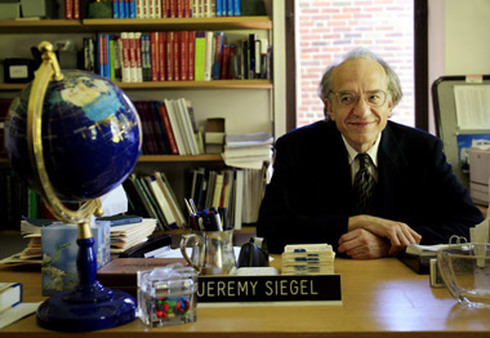 Stock market sage Jeremy Siegel says the Dow is headed toward 20,000 as early as year-end. Siegel has been predicting 20,000 on the Dow since July, but in early March he became more tentative about his forecast because of a possible Federal Reserve rate hike by midyear. After the last Fed meeting in mid-March, Fed Chair Janet Yellen said the central bank’s decision to raise rates will depend on more improvement in the labor market and higher inflation, closer to the Fed’s 2% target. The stock market rallied, on the expectation that the Fed wouldn’t necessarily hike in June. The Fed hasn’t raised rates in nine years. Siegel has called the market correctly before. In April 2013, when the Dow was trading around 14,600, he said it would end the year between 16,000 and 17,000. It closed at 16,577. In January 2014, he predicted the Dow would finish the year near 18,000. It finished at 17,823. Bernice Napach is a senior writer at ThinkAdvisor covering financial markets and asset managers, robo-advisors, college planning and retirement issues. She has worked at Yahoo Finance, Bloomberg TV, CNBC, Reuters, Investor's Business Daily and The Bond Buyer and has written articles for The New York Times, TheStreet.com, The Star-Ledger, The Record, Variety and Worth magazine. Bernice has a Bachelor of Science in Social Welfare from SUNY at Stony Brook.